One of the advantages we have here at agileChilli in developing agile:NPDtech is that it’s built on the agileBase platform, which allows for more rapid development than normal. That allows us to respond to customer requests, our own ideas and market research quickly, creating a rapid feedback loop between the product and its users to improve the system for everybody. For example, over the past couple of days we’ve made major improvements in two of the most widely uses NPD:tech areas – product development milestones and non conformance chasing. Today we will highlight the new milestones features, which arose from conversations with many customers as well as internal workshops. If you use milestones in your NPD processes, you’ll be very interested in taking advantage of these features and if not, they may just tempt you to start! Our core focus has been on making the process of managing large numbers of development products more efficient, so very little time is needed on data entry, allowing automated chasing when deadlines are near whilst letting staff get on with producing innovative new recipes. 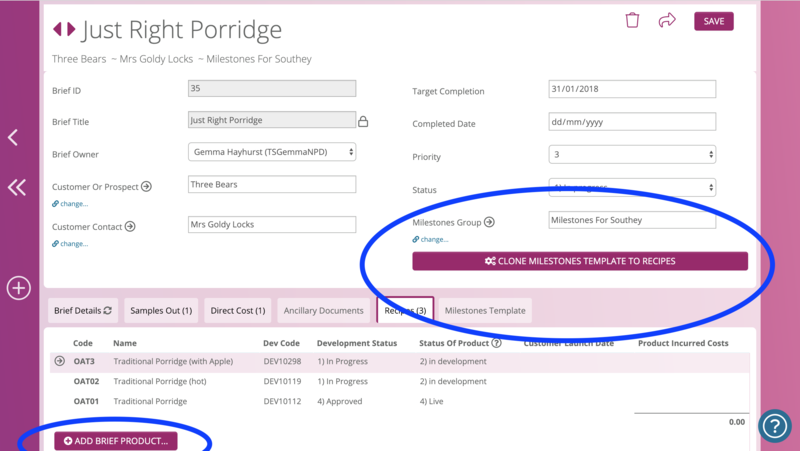 In the Milestones tile, you can manage a template of milestones to be assigned to each product, each with a default owner. As of today, you can now manage multiple templates. When milestones are added to a product, you can choose which template is applied. That means you can assign similar sets of milestones to different products, but with different owners, or you can have completely different sets of milestones. For example, some customers may require additional steps for any products developed for them. You can now assign not only users as owners of milestones, but any email address. That means if there’s someone at your company who should be responsible for ensuring a particular milestone is achieved, but they’re not a system user, they will still be chased by the system. It will still gather their notes and let them amend milestone details. You can even involve your customers or other outsiders, for example to gather feedback. Milestone owners can be set at the template level but also overridden for an individual product. In either case, when choosing an owner, just select ‘add new entry’ at the bottom of the list of users and type in any email address you like. This is a big one in terms of time saving. When working on a brief for a customer (or yourselves), you may be working on a dozen or so products, each with their own milestones, however they’ll usually have the same or similar target dates. Now you can apply milestones to all products in a brief as a group with one click. We look forward to feedback about these new milestones facilities and we’ve also got a lot of other ideas in the works. Please let us know your thoughts!